As the community in Thailand grows stronger and closer as each day goes by. ATT : Art Toys Thailand is one gathering of like-minded collectors and artist under one roof. Events like these are what we need for this scene to grow and we’ve seen what ATM can do, uncover new and exciting designs, new artists and customers. ATT is on their 3rd event and no sign of slowing down as a mixture of well established local artists as well as fresh and exciting artists joining this year’s ATT. ATT is its 3rd event! Congratulations guys. Rounding up a fantastic array of art toys and really fresh works from Thailand’s finest. Some who we’ve covered on The Toy Chronicle but most importantly ATT showing us more gems of Thailand. Here’s a little tease of what you could see and meet at ATT. 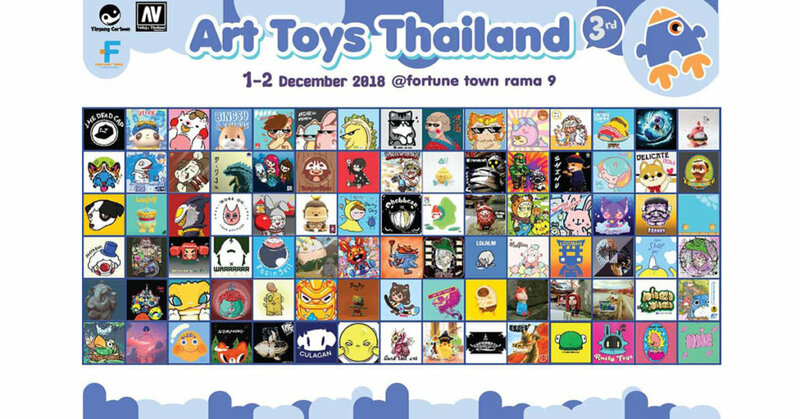 Art Toys Thailand 1-2 December 2018 at Fortune Town Rama 9. Events page HERE for further info.